Cumulus Media Country WFMS-FM in Indianapolis was recognized as Radio Station of the Year by the Indiana Broadcasters Association at its 2018 Spectrum Awards Luncheon. The luncheon was held on Thursday, November 1, at the 2018 Indiana Broadcasters Conference in Carmel, IN. This marks the third year that WFMS has been honored as Station of the Year, with previous wins in 2008 and 2012. VP/Market Manager Chuck Fredrick said, "95.5 WFMS is Central Indiana's heritage Country station and has enjoyed great success by putting our loyal listeners first and providing them with the very best Country programming. On behalf of the entire 95.5 WFMS team, we thank the Indiana Broadcasters' Association for this incredible recognition." 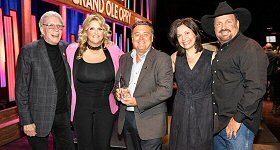 Country WFMS currently has the longest-running format among the Indianapolis market's top ten-rated stations and also has been recognized with several national country music awards and nominations in recent years.